SOUTHFIELD, Mich. – Lawrence Technological University has increased its on-campus housing by 25 percent with the opening of the Lloyd E. Reuss Residence Hall in time for the start of the 2015-16 academic year. 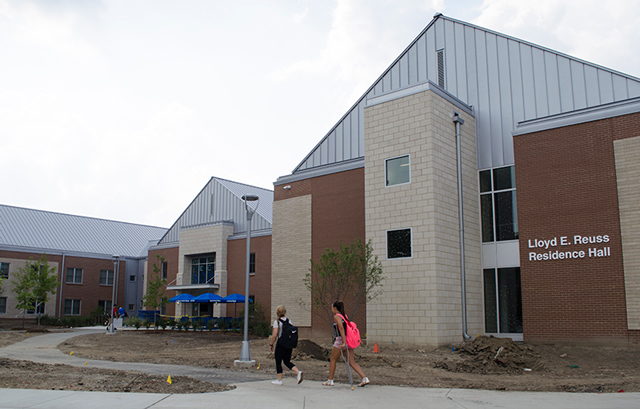 LTU’s third residence hall, which is named in honor of Lloyd Reuss, the longtime chairman of the university’s board of trustees and former president of General Motors, is now the home of 150 freshmen who moved in prior to the start of classes on Aug. 24. Lawrence Tech’s two older residence halls had a combined capacity of 600. Because of high demand, LTU also leases residential suites for 60 additional students at Arbor Lofts on nearby Civic Center Drive in Southfield. The 47,545-square-foot, two-story Reuss Hall has five pods with 16 double-occupancy units. The $11.6 million project has been completed except for the landscaping. Each pod in Reuss Hall has its own common lounge and kitchenette space. Amenities include central laundry facilities on both floors, a bicycle repair shop, a multi-purpose room, a game room, and two conference-type spaces. Increased demand for on-campus housing has been created by the expansion of the athletics at LTU, which became a member of the National Association of Intercollegiate Athletics in 2011. More than 300 students participate on 16 varsity teams and three junior varsity teams, and LTU will add five more teams in the next two years. A strong athletics program and additional residential housing are major initiatives in LTU’s overall strategy to strengthen campus life so that students will have more positive experiences outside the classroom, develop more personal relationships, and choose to spend more time on campus. Lawrence Tech has long been known as a commuter school, and most students continue to commute, but the atmosphere on campus has become more welcoming now that more students live there, according to Dean of Students Kevin Finn. Students from 25 states and 60 countries attend LTU. Reuss, the namesake for the residence hall, has served on LTU’s Board of Trustees since 1978 and was chairman from 1993 until 2014. He has filled many other community and higher education roles, including executive dean of Focus: HOPE’s Center for Advanced Technologies. “Dr. Reuss has brought pride and distinction to Lawrence Technological University and strengthened its pursuit of excellence and service to students,” Moudgil said. Lawrence Technological University completed construction on Lloyd E. Reuss Residence Hall just in time for the start of the new academic year.